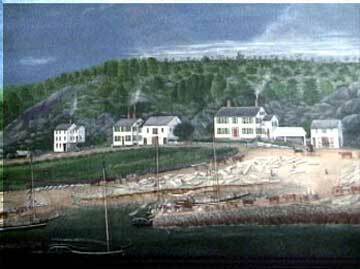 Alfred Wiggin was an itinerant artist who settled in Rockport in the 1840s. Primarily a portrait artist, Wiggin also captured several wonderful scenes from 19th century Rockport, including a beautifully detailed representation of the town’s bustling granite industry at Knowlton’s Corner at Granite and Beach Street. The museum also holds several of Wiggin’s portraits from the same era.